I write this as we have insulation pumped into our old villa's timber walls. I wonder what the rats and mice think of this. Apparently, New Zealand is having a rodent explosion and many of them seem to be at our house. 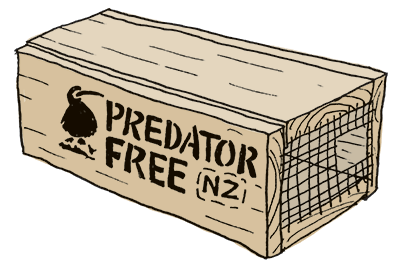 There is a government-backed committment to make New Zealand predator free by 2050 and Kiwis are being encouraged to trap and kill predators in their own backyard. The focus is on rats, possums and stoats, but they would also like to see the back of hedgehogs. I have to admit I couldn't bear to kill the two hedgehogs we found in the sump last summer. Hedgehogs are dying out in the UK but it seems they are thriving here. We have however been trapping rats. We have 12 traps in the attic that Duncan checks on a regular basis and there are now 6 dead rats buried in the garden. Until recently I had three trap tunnels baited with peanut butter and set up around the house to catch rats. These didn't catch any rats, only sweet little field mice (which are also an invasive species). Although I didn't like it, I continued trapping these poor mice until one of the traps caught and killed a sparrow. Another "exotic" species, but that was a the last straw for me and I've stopped using those traps for now.